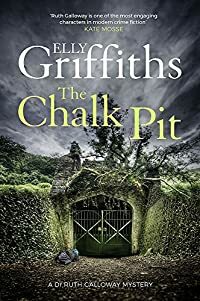 The Chalk Pit by Elly Griffiths is a Dr Ruth Galloway mystery. I’m so pleased that I’ve almost caught up with this series which I’m reading in order – a necessity I think. As usual with a Ruth Galloway book it isn’t long before she is digging up some bones and meeting up with Nelson to discuss whether the bones are really old and so not something he has to get involved in, or are much more recent meaning he has a murder to investigate. It looks to Ruth as if the bones have been boiled as they’re white and very shiny. They’ll have to go off for carbon-14 analysis. Meanwhile some people disappear and a few homeless people are murdered. There’s always been a rumour that underneath Norwich there are miles and miles of secret tunnels, chalk mines from another age, could the missing people be there? As ever Ruth’s personal life is as interesting as the crime/mystery aspect of these books. Towards the end of this one – and just as I had decided that she was going to be more sensible in her old age – she surprised me and it looks like everyone’s life is going to get a lot more complicated. I’ve already borrowed the next one in this series from the library so I don’t have long to wait to find out what happens next. Honestly I think I’m more interested in the personal lives of the main characters than the mystery and crimes involved. This entry was posted in Books and tagged Dr Ruth Galloway, Elly Griffiths, murder mystery, Norwich setting, The Chalk Pit by Katrina. Bookmark the permalink. I love so many aspects of this series: the archeology, the mystery, and the personal lives of the characters. I meant to say that I’m lucky that I can picture many of the locations, especially King’s Lynn. I really like this series too but thought I was caught up and (now that I have checked on Goodreads) realize my last one was #6. Thanks for the reminder! Thanks for dropping by. I hope you continue to enjoy the Ruth Galloway books too. I enjoyed my visit to Staircase Wit.